Is this peculiar to the Irish Guards, or common to all Foot Guards? Last edited by Luke2 on Thu Jan 26, 2017 2:24 pm, edited 1 time in total. I believe each Guard has a different design for staff(color?) sergeants and WO II. Larger badges for WO I, sometimes superimposed over four chevrons. Hi guys — this is a great topic and I'm surprised it hasn't come up here before. The finer details of the insignia and the various embellishments with increasing rank for the full dress tunics for the Footguards regiments are not immediately apparent until you look closely at the different ranks. The main four groups are: Officers, Warrant Officers, Senior NCOs, Junior NCOs & guardsmen. Marc, your top pic is the badge for the Scots Guards, with the Star of the Order of the Thistle. Note the Warrant Officer uniform embellishments of the gold lace to the collar, the two bands of gold lace around the cuffs and the gold lace that edges the cuff flaps and the buttonholes on the flaps. WOs also have gold piping around the edges of their shoulder straps; NCOs and guardsmen have plain white piping around the shoulder straps. I can't find a decent pic with the details of the Colour Sergeants full dress tunic being worn, so here's one on a hanger instead (!). I'll add one later if I can find a good one. Note the plain dark blue collar but with badges in bullion. Senior NCOs also have gold lace to the button holes on the cuff flaps but, unlike warrant officers, there is no gold lace edging to the cuff flaps or around the cuffs. There is similar gold lace to the buttonholes on the rear skirt of the the tunic. Junior NCOs and guardsmen have white-laced buttonholes and plain white embroidered badges on collars and shoulder straps. A non-CSM appointment WO2 (left, front), a Colour Sergeant (right, front), a Lance-Sergeant (appointment given to full Corporals in the Footguards regiments, right, back, with three white chevrons and plain cuffs/collar) and, just visible, a Sergeant (left, back, with three gold chevrons and gold buttonholes on the cuff flaps). Note that the senior NCOs and the WO wear white gloves, the junior NCO does not. The sergeants' sashes are red, the WO's sash is crimson. Oh, and the Warrant Officer wears a sword! The special badge of the Colours, surmounted by a Crown with crossed swords below, is specific to the appointment of WO2 CSM. Non-CSM WOs2 wear the standard crown/wreath insignia of the WO2 rank (as in the pic above). For a Colour Sergeant, the badge is worn over the three stripes of a sergeant in gold lace on the full dress tunic and a smaller version is worn over chevrons created in outline with gold soutache in No1 Dress (blue patrol tunic). The equivalent ranks of Colour Sergeant / Staff Sergeant in non-Guards regiments and corps wear a crown above three chevrons. 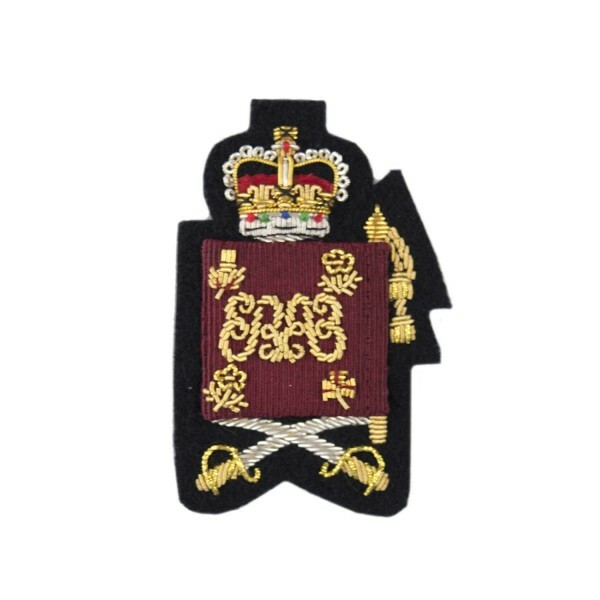 Similarly, the BIG bullion embroidered Royal Arms badge, worn above the elbow, is specific to the WO1 RSM appointment and other WOs1 wear the more usual Royal arms badge of the WO1 rank (most commonly seen in the regimental bands). The Big Badge worn over four chevrons, again, above the elbow, is unique to the appointment of Garrison Sergeant Major, London District and was re-instated in 2011. Prior to this, the GSM wore the same Big Badge as the RSMs of the various Footguards regiments. @Medic in uniform: Thank you! That was very informative; especially that only certain appointments are wearing the special rank badges. In the photo below, I assume the WO to the right of the Duchess is the RQMS. The difference in colour btw the WO's and the Sergeants' sashes is clear in this picture. I have never noticed it before. The Duke's sash looks darker, but that might be with the contrast to his blue uniform. Finally, I take it that WO's outside the Guards do not wear swords? Hi Luke! Glad to be able to help! Yes, you're right, the officer-type crimson waist sash is an even darker shade and a different material. Different again are the gold and crimson sashes that the officers wear for full State ceremonial when the Sovereign is present, but the gold State kit is probably almost a post in itself! I can't remember the exact details (I'd have to look them up...!) but you get the general idea and you can see the Sergeants' pattern and the WOs' pattern in the photo. Oh and, yes, WOs from other units definitely do wear swords! Equally, WOs will also march in formation with the other ranks carrying rifle, even the RSM if he wants to see how a particular drill is working from the "inside." I have no connection to this site, commercial or otherwise (! ), I just like his photos! A very god way to spot the differences in the uniforms. If you look carefully, there's also the general officer variant of the scarlet full dress tunic, with heavy bullion embroidered oakleaves on collar, cuffs and skirts, as worn (with plumed cocked hat, obviously...) by the Major-General commanding the Household Division. It seems that the intricacies of the Foot Guards in full dress can amuse us for a long time. Here is the next question: This guy has a cocked hat; he is not a general, but who/what is he? The best pics for some of these things are again seen in the photos of the Queen's Birthday Parade (better known as Trooping the Colour) and other ceremonial events which is where you will see the the whole gamut of our uniform minutiae! Only here will you see the General Officer and General Staff Officer full dress uniforms and their cocked hats with their big, drooping white and scarlet plumes. To answer your question, I'm not 100% sure but, if I recall correctly, the cocked hat, with upright plume of the same colour as those worn on the regimental full dress bearskin caps, is specific to the appointment of regimental Quartermaster. Again, not 100% sure but I think this is usually a former warrant officer commissioned in the rank of Captain and appointed to this role (not to be confused with the WO2 appointment of RQMS). Another quirky question: If Mr. Else is a Lance sergeant, why isn' he in uniform? It's still a rather natty look though...! I bet he could answer all our trivia questions -- and without having to look anything up...! I am sure Sergeant Else has sewn his own suit. I wonder if the fancy stick he is holding is some kind of old yardstick, once used for measurements by army tailors. Searching the Internet, I found that as least as late as during WW1, every British regiment had a Sergeant Master Tailor. They seem to have been in uniform though. a question about the lance-sergeant. First sorry if it sounds insulting as its not intended to be but isn't he a bit short to be a guard ? I thought they had height requirement. Medic_in_Uniform wrote: To answer your question, I'm not 100% sure but, if I recall correctly, the cocked hat, with upright plume of the same colour as those worn on the regimental full dress bearskin caps, is specific to the appointment of regimental Quartermaster. Again, not 100% sure but I think this is usually a former warrant officer commissioned in the rank of Captain and appointed to this role (not to be confused with the WO2 appointment of RQMS). Yes, the QM is still always commissioned from the ranks as a captain. He's usually a former RSM and therefore often the most experienced soldier in the battalion. QMs can be further promoted to major and lieutenant-colonel (although the latter would obviously be serving in an HQ appointment and not with a battalion, as otherwise he'd be equal in rank to the CO!). Another interesting fact. A Guards QM continues to wear the ORs' bearskin (made from the fur of the male bear) and not the officers' bearskin (made from the softer fur of the female bear). If you look closely you can see the two types of bearskin are subtly different. He has also, of course, always been entitled to wear the Long Service and Good Conduct Medal, which officers who had never served in the ranks were not. It was always a good way to tell whether an officer had been commissioned from the ranks or not. Although the rules were changed in 2016 so now all officers are eligible. Luke2 wrote: Another quirky question: If Mr. Else is a Lance sergeant, why isn' he in uniform? Thanks, Necrothesp -- good to know my memory isn't failing me yet! I hadn't spotted the minor detail of the QM continuing to wear OR bearskin, so thanks for that. Do you know what the criteria are for wearing the cocked hat vs. the bearskin? I'm guessing it's something to do with being formally on parade in formation (bearskin) vs. being in attendance at the parade (cocked hat) ...? I'm guessing it's a rehearsal, hence the presence of the tailor in civvies, and therefore not a formal inspection. Yes indeed! Or even just some sort of uniform / tailoring inspection? As to the Master Tailor, the double-breasted striped suit with homburg hat practically IS their traditional uniform, isn't it...? !